This week saw the price of silver creating its own path in divergence from gold, falling just a bit, by $0.14, a 0.8% fall for the week. When the New York COMEX futures trade ended, silver was holding at $17.14, even though it did grow in the electronic market by $0.06 by close of business in the Eastern time zone. The chart below shows a technical roadmap for silver, showing an uncertain short-term but a set up for a positive end to this year and the beginning of 2019. In this chart, the minor resistance between the black dashed lines of $17.30-$17.50 is causing a temporary halt in silver’s growth. 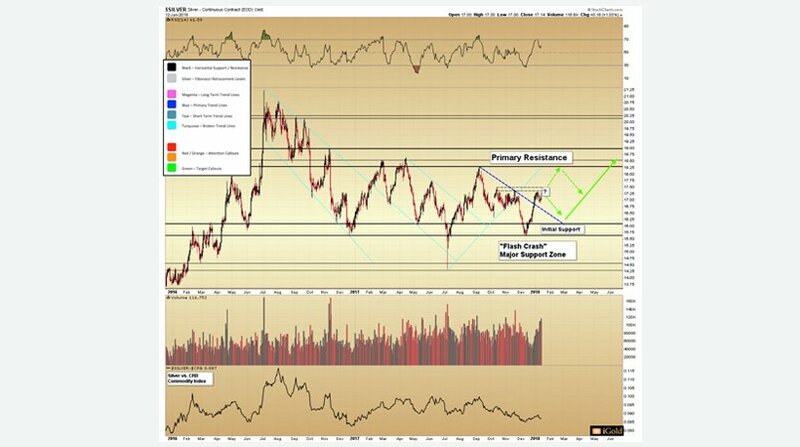 Should the buying of silver push it over this threshold, then it is our expectation that it will easily enter the $18.30-$19.00 Primary Resistance zone. However, should gold falter below its 2016 high of $1378, silver will not have the follow-through necessary for growth and will be stuck in this minor resistance as its short-term peak. The Relative Strength Index, or RSI, as seen in the short-term at the top of the chart is neither overbought nor oversold. Silver had a slower week than gold, causing an increase in the GSR (gold to silver ratio) of .8, bringing it up to 77.9. Although a generally higher GSR is negative for both silver and gold, during each primary wave amidst a bull market, it is perfectly normal for silver to fall behind gold from anywhere from a few months to up to a year. We expect the ratio as a net sum to fall over time. Silver trading volume was almost as high as 514K contracts for the week, making it the highest weekly total since November of 2016, which saw 577K exchanged contracts. This happened amidst a net down-week, a negative indicator. However, if you look at the data, it is clear that the highest single volume day was Friday, a positive day when almost 117K contracts were exchanged. This makes it impossible to say that the weekly volume as a whole was negative. The graph below shows that the Wheaton Precious Metals (formerly known as Silver Wheaton) model is staying strong, and is, in fact, working towards a return test of an $18.30-$19.00 Primary Resistance throughout the short-term. If you look at the green-shaded areas, you can see that they correspond with the market-leading silver streaming company, WPM, at the top and the primary product, silver, at the bottom. An important part of being a technical analyst is the ability to recognize mixed signals at a short-term juncture, and that is what we are currently seeing with silver. We expect a fifth challenge of Primary Resistance no later than Q2 that will lead to a breaking of the 2016 highs by the end of this year or early next, whether or not silver advances first to Primary Resistance or falls first towards the now broken trendline of $16.60, shown in blue. 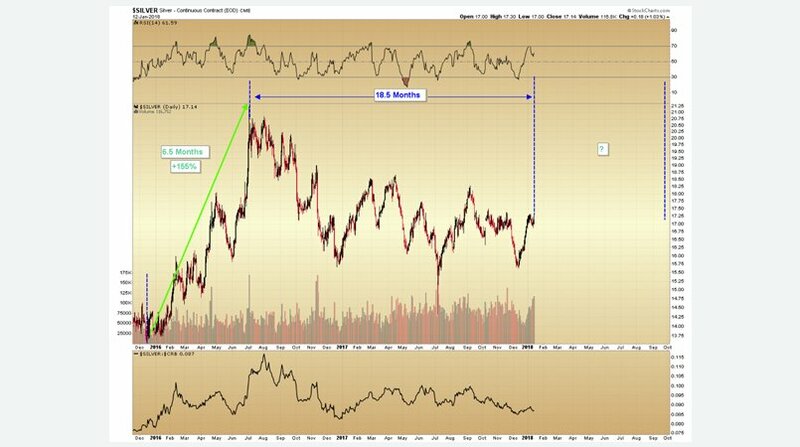 The average of silver’s consolidation of this ten-year period was 21 months in sum. On average, advances from the breakout point of the consolidation were 118% and lasted 6.8 months. 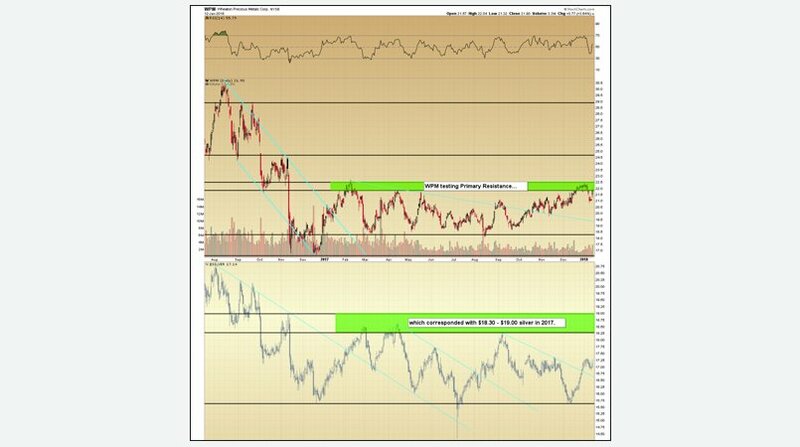 Take into consideration that the surge of the first half of 2016 for silver was 155% and it has now been in the process of consolidating since July of 2016. We are unable to predict the future, but repeating human patterns exist for a reason. 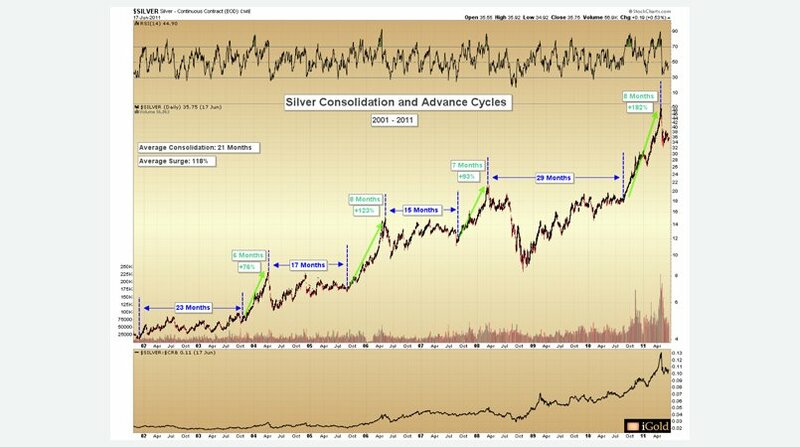 Based on the historical patterns shown here, next year seems to be a very likely option for silver’s second surge following its 2015 lows. It would be wise to prepare for this eventuality now. Technical analysis shares many similarities with mapping: both are based on the observations of repeating and embedded patterns in human nature. This article is provided as a third party analysis and does not necessarily matches views of Bullion Exchanges and should not be construed as investment advice. Bullion Exchanges has an affiliate partnership with ValueWalk.